Island Air, the value leader airline in the Hawaiian Islands, is making it more affordable to travel interisland with the introduction of its “Hele Mai Saver Fare.” Starting immediately, travelers can save by booking the first and last flights of each of Island Air’s routes. Fares on the first and last flights will be $60* one way between Honolulu, Kahului and Līhu‘e, and $70* one way on flights between Honolulu and Kona. Island Air’s flight schedule can be viewed at: https://www.islandair.com/flight-schedules. Reservations can be made online at www.islandair.com or by calling (800) 652-6541. *The Hele Mai one-way fare includes one federal transportation segment tax and one security fee. Other taxes and fees may apply. 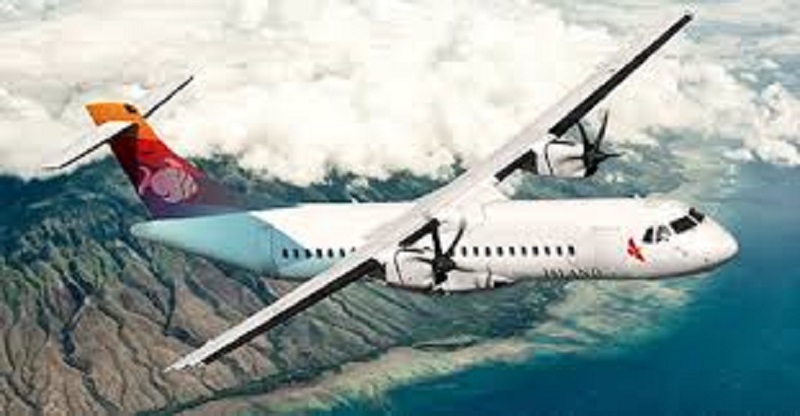 Island Air held a blessing and naming ceremony today for the first of three new Q400 turboprop airplanes it is acquiring as part of a long-term plan to upgrade its fleet and expand the company’s presence in the interisland market. Island Air owners, managers and employees, along with elected officials, visitor industry partners and other special guests gathered at the Island Air hangar off Lagoon Drive to bless and dedicate the new aircraft prior to its inaugural interisland flight tomorrow morning. Island Air’s new fleet of aircraft will bear names that recognize seven core values developed by the airline’s team members and are integrated into the company’s mission and corporate philosophy. The first Q400 aircraft is named Ola Kūpono, which means “safety in everything we do.” The names of future planes will focus on other core values including genuineness, doing the right thing, accountability, striving for the highest summit, trust and persistence. With the addition of the new aircraft, which will be put into service on Jan. 12, Island Air will increase the number of daily roundtrips between Honolulu and Kahului from six to seven, and the number of daily roundtrips between Honolulu and Kona from five to six. The new flight schedule also will see slight time changes in the six daily roundtrips between Honolulu and Līhu‘e. The new flight schedule is available on Island Air’s website at www.islandair.com/flight-schedules. The Q400 has a seating capacity of 78 passengers. The aircraft has a maximum cruise speed of 414 miles per hour and a maximum operating altitude of 27,000 feet. The Q400 is 30 percent faster than conventional turboprops and features a new, advanced noise reduction and vibration suppression system to allow passengers to enjoy a quieter, smoother cabin experience. The new aircraft also burns 30 percent less fuel and produces 30 percent lower emissions on short-haul routes, making it more environmentally friendly compared to other aircraft currently serving the Hawai‘i market. In addition, its noise footprint is two-and-a-half times smaller, which will be less disruptive to the community as it flies overhead. Starting Tuesday, November 15, Island Air customers who are not enrolled in the airline’s Island Miles program will see an increase of $10 in their checked baggage fees. The new baggage fees for non-members will be $25 for the first checked bag, $35 for the second checked bag, and $35 for each additional checked bag. For Island Miles members, fees will be $15 for the first bag, $20 for the second bag and $35 for each additional bag. To become an Island Miles member, visit www.islandair.com/island-miles. Island Miles members can enjoy benefits such as mileage rewards, fast rewards, flexible rewards, sharable rewards, lower baggage fees and priority boarding. There is no cost to join the Island Miles program and members will also receive monthly email updates on specials and promotions. For more information, visit www.islandair.com or call (800) 388-1105. 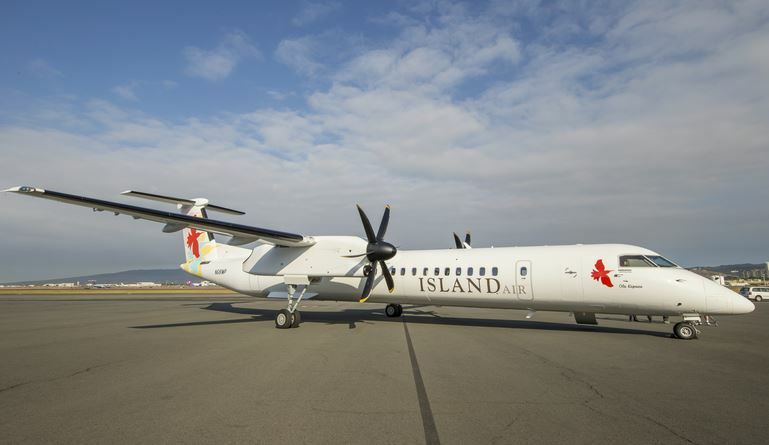 Island Air today announced it has extended agreements with three unions that represent its pilots, dispatchers, mechanics, flight attendants, customer service and ramp agents, and other employees. Island Air reached a letter of agreement (LOA) with the Air Line Pilots Association, International (ALPA), which represents Island Air’s 42 pilots. Island Air also reached an agreement on an extended contract with the Transport Workers Union (TWU), Local 540, which represents the airline’s five flight dispatchers. The third agreement is an LOA with the International Brotherhood of Teamsters (IBT), Local 996, which provides collective bargaining for 216 Island Air employees, including aircraft mechanics and inspectors, aircraft cleaners, ground service equipment mechanics, fuelers, flight attendants, stock clerks, and customer and ramp service agents. Island Air today launched daily air service to Hawaiʻi Island as part of its continuing efforts to expand its presence in the Islands and offer residents and visitors an alternative option for interisland travel. The airline also announced it has hired veteran tourism industry leader George Applegate to serve as its representative on Hawaiʻi Island. Island Air officials, along with government, business and visitor industry leaders from Hawaiʻi Island and Oʻahu gathered at the Kona International Airport this morning for a blessing of the airline’s new check-in counter located in Terminal 1 and departure/arrival gate (Gate 5). Following the blessing, passengers on the inaugural flights arriving into and departing from Kona were greeted with lei and entertained by keiki from Waimea’s Hālau Hula Ka Noʻeau. In partnership with the Big Island Visitors Bureau (BIVB), guests also were given a tour of the Natural Energy Laboratory of Hawaiʻi Authority located a short drive from the airport. During the celebration, Island Air’s president and chief executive officer David Uchiyama announced that Applegate will serve as Island Air’s representative on Hawaiʻi Island. Applegate will support the airline’s sales efforts and assist in promoting Island Air’s business on Hawaiʻi Island. Applegate has more than 40 years of experience in the visitor industry, including 24 years with the BIVB, 13 of those as its executive director before he retired in 2013. In 2015, he served as an executive assistant to Mayor Billy Kenoi where he assisted with various tourism projects for Hawaiʻi Island. He continues to provide tourism-related consulting services on a contractual basis to the County of Hawaiʻi through his firm George Applegate Consulting. “Having another alternative for interisland travel is critical for our community and visitor industry, which is why I am excited about this opportunity to assist with the growth of a second interisland airline that will support both residents and visitors,” said Applegate. In addition to increasing seat capacity to Hawaiʻi Island with five daily roundtrip flights between Kona and Honolulu, Island Air hired 22 employees to service the new route. The Kona-based team of customer service agents and ramp agents is being led by Shardae Kaupu Lopez, who will serve as Island Air’s Kona station manager and oversee the airline’s airport operations. Lopez is originally from Miloliʻi and started working for Island Air in 2012. Island Air is the value-leader in the Hawaiian Islands, offering 238 convenient flights each week between O‘ahu, Maui, Kaua‘i and Hawai‘i Island. The affordable alternative for interisland travel, Island Air’s 64-seat ATR-72 aircraft are able to provide captivating up-close views of Hawai‘i’s remarkable landscapes. Founded in 1980 as Princeville Airways, the company was renamed Island Air in 1992 and has been proudly serving the islands of Hawai‘i for more than 35 years.